I have tried so many recipes for homemade shampoo. I am going to share a little bit of my experiences with you, then let you in on my shampoo recipe. This is probably going to be a pretty long post, but please bear with me… you will learn a lot I promise 🙂 After reading about the chemicals in store-bought shampoo I was determined to find an alternative. When I first started researching going “poo free” as they call it. I heard about using baking soda and vinegar. I wasn’t quite ready to make that dramatic of a switch, so I started off with Crunchy Betty’s “Sorta Poo” (I love her blog btw!) Now I absolutely LOVED how this stuff made my hair look and smell. It was heavenly! It is made with castile soap and coconut milk. There were 2 downsides though…. One my hair felt like it had a little bit of a residue but that could have been from the coconut milk I was using. Two you have to make a new batch each time you shower, or store it in the fridge. A few times I forgot to make it, or didn’t have time so I had to reach for the store-bought shampoo as back up. So I decided to make it ahead of time and store it in the fridge. A few times I jumped in the shower only to remember my shampoo was in the fridge, not fun. It also is REALLY cold when you do it that way, my 4-year-old was not a fan of really cold shampoo lol. So I decided that it just wasn’t working for me. But if you have castile soap you should really try this at least once, your hair will look amazing! If you do try it, I would not recommend using peppermint castile soap, unless you like a really strong tingly feeling. So after sadly giving up my “sorta poo” I decided I was ready to try “no poo”. This is by far the best information I found on “no poo”. I loved how cheap and easy this was, and you don’t have to store it in the fridge. You wash your hair with baking soda, and use an apple cider vinegar afterwards to soften your hair. It was fantastic for my daughter’s hair, and for my roots. The problem with this for me was… my hair has been processed so many times. There is no pretty way to put it, its fried! lol. So unfortunately this just did not work for me either. My ends needed a little more lovin! I am in the process of growing my natural hair out now, so maybe I can go back to this one day 🙂 I have also seen people complain about their hair not smelling yummy like with regular shampoo and conditioner, which is true. But to fix that all you have to do is spray your favorite body spray on your brush when you brush your hair, problem solved! So first, brew your tea. I put the tea bags right into the cold water, then heat the water just to where it’s steaming and you see little bubbles on the bottom. Then I take it off the heat and let the tea steep for about 5-10 mins. At this point you can let it cool off some before adding in the rest of the ingredients if you would like. 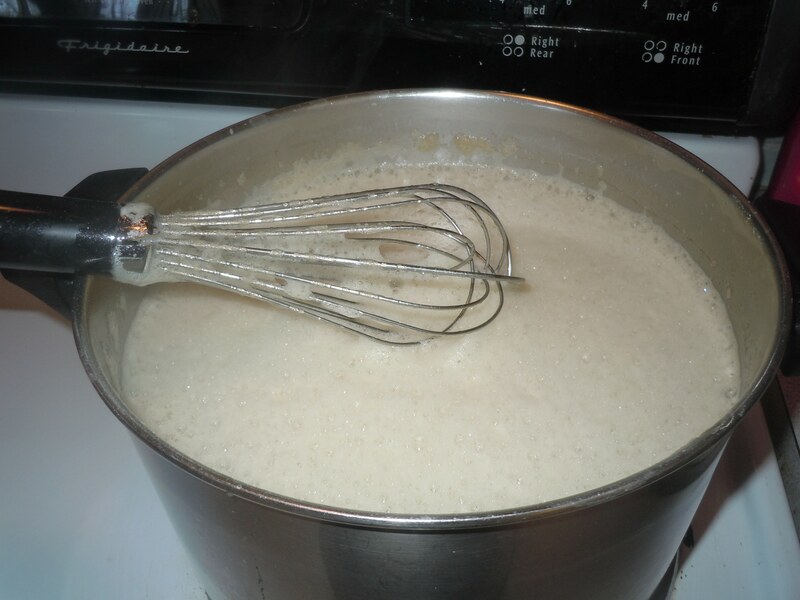 You will want to whisk in your xanthan gum next, a little at a time. Then stir in your castile soap and essential oil. 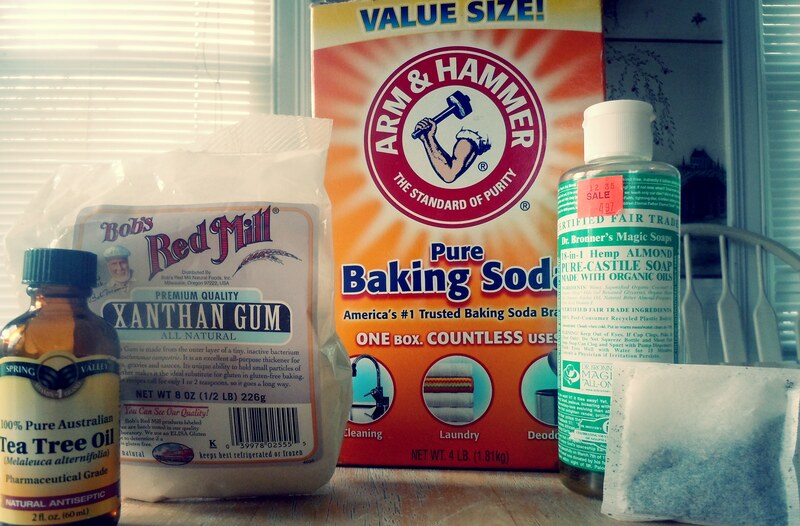 I keep forgetting to add the xanthan gum before the castile soap, silly me. So I ended up with a foamy top on my mixture while stirring in the xanthan gum. Not a big deal except it causes little clumps and its hard to see when it’s all mixed in. It doesn’t affect the end result, its just a little bit of a pain. This is what happened to me, lol. Here is what it will look like when its done. I had little clumps because of my oopsie, but they mostly dissolve anyways so its nothing to worry about. After it cools completely stir in your essential oil then just pour some into an empty bottle for the shower and store the rest under the sink in an old milk or water jug. Use just like regular shampoo, and enjoy your clean, pretty smelling, shiny hair 🙂 There are so many variations you could do with this as well. The first batch I made was chamomile tea, with lavender castile soap and lavender essential oil. You could also do green tea, with citrus castile soap and lemon essential oil, or coffee with almond, etc. I am still trying to find a conditioner recipe that I am happy with, so for now I am using a sulfate and paraben free kind called “Simply U Conditioner” (Color Shine formula) along with this shampoo. Please please please try this and let me know what you think! I hope you will love it as much as we do. 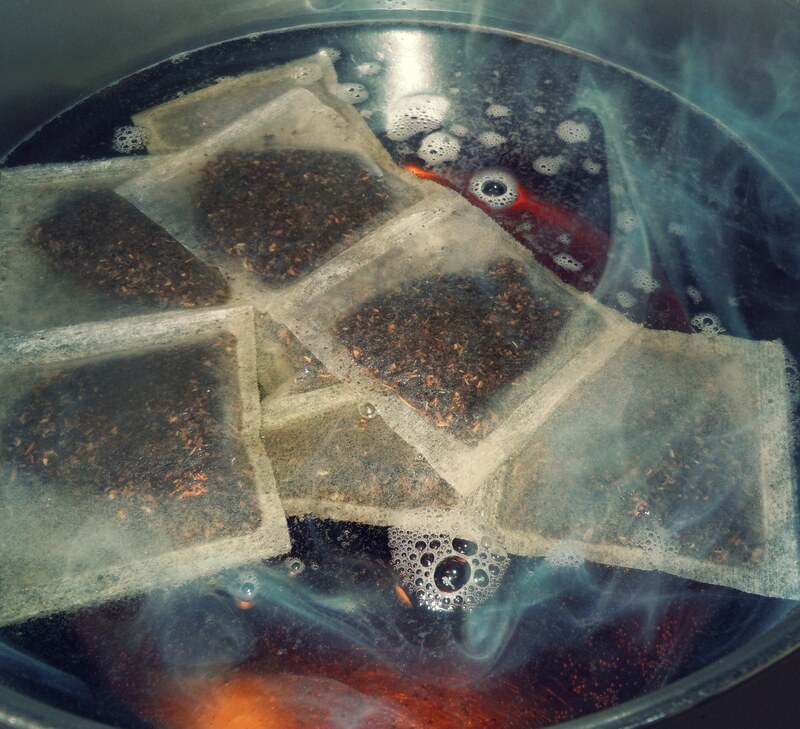 How many tea bags did you use for the 1 gallon of water? Looking forward to trying this recipe. Thanks for sharing! Thanks Ashley, I am making a batch as we speak and so excited to try it out. Have you had any luck finding and DIY conditioner? Thanks again- I really enjoy your blog! I just wanted to post a link (below) to some really really good advice regarding going poo free. This page described my situation exactly- greasy hair is apparantly normal when switching over to natural. I also read that some women with hard water couldn’t use baking soda for some reason with good results. I have hard water so this may be one issue I’ll need to troubleshoot. Lastly, I wanted to mention that this shampoo recipe makes a delightful hand soap. It leaves my hands feeling clean and soft (and smells wonderful too!). Thanks Ashley! Hey there, I was wondering I am going to make organic shampoo, but I would like to make it a bit thicker. I am a bit questionable about using Xanthan Gum? Is is bad for you and your body. Is Guar Gum a safer option. Your reply would be much appreciated!!! I love this shampoo! My curly sort of dry, long hair loves it! I use a spray bottle and no xanthan gum! I made it with green tea! My hair didnt like when I used baking soda and water! Neither did my scalp. I will use this shampoo forever! Thank you so very much! By the way, i rinse with acv and water! Perfect combo! Hi Ashley, I made your recipe with black tea and lavender castille soap and I have been using it for a week now. I wanted to post my review and get some advice. I like the natural smell of tea and lavender so I didn’t need to add much for essential oil. I was expecting the texture to be a little thicker than it turned out. Is yours on the runny side? So I put it in a squirt bottle and tilt it over onto my head and this seems to work. But my shampoo doesn’t lather at all like the way commercial shampoos do so I haven’t been able to get the shampoo into all my hair. I end up using quite a bit in an effort to penetrate all my hair but it has been a bit tricky. The texture of my hair is a bit dry after I rinse all the shampoo out and before I apply my conditioner. Even in the shower, it feel like my hair is just not getting clean. I really really want this to work but I have been honestly disappointed by how greasy and dirty my hair feels after I wash it. I normally shower every 2 days but I feel like I need to wash my hair everyday because of how dirty it feels. I was reading that sometimes it can take time for your hair to adapt to a new product. Did you find this to be true for this shampoo recipe and how long do you think it takes- 2 weeks, 4 weeks?, etc. I want to give it a fair chance but I want clean hair 🙂 My hair type: normal (not oily or treated), long, straight and fine. Have others had a similar experience or can offer any advice? I haven’t tried the recipe, but would it work in a squirt bottle? Then youll be sure it gets right to your roots and all arond your head by lift up and spraying ections from nderneath. Or maybe this would work in a foaming hand soap bottle? Not sure if there’s enough soap in it to make it foam u but worth a try. Sounds like you may have problems with hard water? I have VERY hard water and I’ve had similar results with no-poo, bar shampoo, pine tar soap, all natural store bought shampoo…Some methods leave my hair looking and feeling beautiful after the hair is dry and some still left my hair feeling gross, like no-poo and pure castille soap. But they all have pretty much the same feel while washing: tangly, dry, filmy feel in the shower. My white vinegar and lavender EO rinse (in a spray bottle) helps get rid of it. I keep mine in an old dishwashing soap bottle now so its very easy to squirt onto my head. Yes hard water could be a problem too. Thanks for the reply Megan. I am having the exact same problem and my hair type is long, straight and fine. I get oily scalp and straw like ends, very static too. I feel like I have been on a week long camping trip and am dying to get my hair clean. I really want this to work (it’s a fantastic body wash though). It has been one week, do I need to stick out a longer detox or is there some thing wrong with my “poo”? Or is it me? I know diet can effect hair as well. Any help or encouragement would be great! Anyone going on no-shampoo/solid shampoo/homemade shampoo methods needs to read up on ‘funky hair syndrome’ because that may be what you are experiencing. It takes a while for the hair to adapt to homemade products vs commercial products, because they work and clean in very different ways. It’s really a long-term, committed change. It has definite perks and rewards, but there is a ton of information out there on the subject. I suggest doing some research. Baking soda requires *thorough* rinsing, and since this is really hard to do without spending a long time in the shower, going over the hair with a vinegar solution usually helps neutralize the rest of the baking soda left behind. Not sure if I’m missing something here but the recipe only calls for essential oil but in the picture you have tea tree oil and in the directions you say to add the essential oil with the castile soap then again after it cools. Maybe it’s my blonde showing but, huh? I’m dying to try this!! I just started following your blog and I am so excited to try this! I have 3 girls. My oldest has very thick hair while my other 2 as well as I have fine hair. I hope it works out great for us! Thanks! I will let you know how we like it. I think I will try peppermint tea with peppermint oil! My husband & I have been adding peppermint oil to our shampoo & we love it! Also to body wash it gives you a great wake me up feeling! This looks awesome. I love trying out DIY stuff like this-thanks for the post! I don’t know if you will still need this information as it’s been nearly a year since your post, however, it could be psoriasis. Either way, if you’ll make a Comfrey tea or it also comes in a salve or shampoo form, this should clear you up in no time flat! April that sounds terrible to go through! This shampoo is definitely more gentle than castile soap alone, I really hope it will help you! but now i have to see if using chamomile tea in this shampoo will work the same …. Hi Ashley, thanks for the shampoo recipe! I do have three questions for you. 1.) I do not drink tea, so I had no idea what kind of tea to buy. I ended up settling on Great Value green tea. I really don’t know why, I guess because i’ve always known green tea to be good for you. Is this okay? 2.) I made a batch of shampoo today, but in the middle of making the shampoo (right after I added the baking soda and I was to let the tea cool), I got interrupted and had to go to work. The tea/baking soda mixture cooled on the counter for about 7 hours. Is it still good? I went ahead and finished it so as not to waste anything. 3.) After getting home and finishing up the batch, when I added the xanthan gum it was pretty clumpy. I know in the directions you say it’s not a big deal, but the clumps didn’t seem to go away. Thoughts? Whirl it in the blender to break up the clumps. I am going to make this tonight – can’t wait to try it. I do have a question – have you perfected a conditioner yet? If not, where do you find the one that you use? I hate to use natural shampoo and then put more chemicals (sulfate) on it when I condition it. Lyn I hope you like the shampoo 🙂 I have not found a conditioner recipe that I am thrilled with yet. The conditioner that I use is Simply Conditioner. I use the color shine formula. It is around 5 dollars for 24 ounces at Walmart and smells really good. I don’t think its all natural but its better than most. I hope you find one you like! Thanks so much- I will look for that conditioner. I have one more question- is this shampoo ok for highlighted hair? Will it strip the color? That is great info, thank you for sharing. I love her blog 🙂 I have had this shampoo sit under my bathroom sink for a few months with no issues. Hey, just curious if the xanthan gum is necessary for cleansing or just for thickening. I love this idea! I will be trying it soon! I’m wondering it, for gray cover up, one could use used coffee grinds steeped in water instead of tea bags. This would be for dark hair, like I have, of course. Miranda, if you decide to try it please let me know how it works 🙂 Even if it doesn’t cover grays it would still smell lovely! Why tea? Maybe I missed that. I am thinking about adding in a bit of coconut milk to this concoction because I like more of a “Cleansing Conditioner” than a shampoo. Think that would work? Lastly, I have made shampoo before and whipped it up in my stand mixer. It makes it very creamy and wonderful. If I added in coconut milk, would it work to mix in the stand mixer? Thanks for stopping by Karen! You do not have to use tea if you don’t want to. Plain water works perfectly fine. I just liked the scent and color it added. I am not sure how coconut milk would work in this mixture. I would try making the recipe like normal and then adding in a small amount at a time and see how that works. If you do add coconut milk you will have to store it in the fridge. I am not sure if I would try mixing it in the stand mixer if you add the coconut milk it might foam up too much. But I think I will try making this in my stand mixer next time, thank you for the idea! 🙂 I hope it works out for you! If I make herbal tea and don’t refrigerate it, it gets moldy after a few days. Does this shampoo made with tea get moldy? OK, so it’s been about a month since my little guy and I have been using this shampoo and we love it!! Our hair is mega soft and my curly hair has actually become a little more easy to handle too!! (My best guess would be the lack of sulfate). And I love that I can customize the scent to what I like. Anyways, like all of the stuff I’ve tried from your blog I highly recommend it! Thanks Ash! Thanks for the review Martha 🙂 So happy you are getting great results from it as well! Have been buying a lovely olive oil-based natural shampoo, but it’s pretty pricey. Am cooking up your recipe now. I already had all the ingredients including lavender castile just sitting under the bathroom sink. Yay. Thanks! Just tried it. Smelled great. Seems to work terrific. Feel like I owe you some compensation! Thanks so much for the recipe. I made it with a combo of chamomile tea and lavender castile soap. It smells great! I have been using it for several weeks and really like it. The lack of lather took some getting used to as I’m brainwashed to believe lather means clean. 🙂 I have been wondering if there is a way to make it a bit thicker. Any thoughts? Thanks again! hi, can I ask if how long does it takes ? i mean how long before it expires? thank you so much ..
Julie somehow I missed this question until now, so sorry! I have been able to store some in a jug under my bathroom sink for up to 3 months until it started to smell funny. As long as you store it in a cool, dark place it should last long enough for you to use it all. If you are concerned about this you could make a half batch. Just give it a whiff each time you refill the shampoo bottle and you will be able to tell if it has started to go bad. After collecting all the ingredients, I was finally able to make this recipe. And, I absolutely LOVE how it made my hair feel! It actually feels clean! Not only that, it worked well as a detangler. I have really long and thick hair that falls out in handfulls when I am in the shower. I was a little hesitant to use the shampoo because of my need to detangle and de-hair, so to say…but I was pleasantly surprised! After looking at the ingredients on my bottle of store bought conditioner, I really wanted to stop using it, and now I can with this two in one shampoo! Yes, it was kinda weired that it didn’t foam and I felt like I was using a lot, but the results are worth it, my hair even felt lighter and looked shinnier! Thanks so much! I should add, that I really enjoy your blog and look forward to more homemade recipes! P.S. I was excited to see that you had a recipe for deoderant, too! I can’t wait to try that! Thank you for the review Elise 🙂 I am so happy that you like it. My hair is also more shiny and a lot healthier since I have been making & using this shampoo. Just wanted to send you an update… I’ve been using this shampoo since August. Also, I use apple cider vinegar for detangling/conditioner. It’s a great combo and my hair is soooo much healthier and shiny! I would encourage anyone to try this recipe! Oh, I also use your homemade deoderant. It is sooo much better than stor bought deoderant. I won’t go back! This is a reply to Elise’s 2012 comment that she was loosing handfuls of hair each time she shampooed (this was completely unrelated to Ashley’s shampoo recipie– Elise was wanting to try Ashley’s shampoo in hopes that it might resolve the problem). I know I’m a few years late in posting this, but maybe it will help somebody else with the same problem. I had a similar experience to Elise. I started loosing a lot of hair every time I shampooed (had nothing to do with the type of shampoo, that hadn’t changed). Now, I am aware that hair statistics say it’s natural to loose up to 50-80 hairs a day, but I was loosing massive amounts of hair, and my hair was noticeably thinner. I started looking for environmental and product changes that could account for the problem– but there did not seem to be any. I had moved to a new place about a year previously, but my problem did not start then, but I still wondered if the hair-loss could be environmental. I decided to do an experiment and wash my hair in distilled water. I took a huge water-bottle with a sports cap and I filled it with distilled water, (if you can heat it a little before pouring it in it is nicer), and I used that to wet my hair down, as well as rinse out my shampoo. I let no tap water touch my head. After a few times of doing this, I noticed I had stopped loosing hair. I did not go back to using the tap water. My hair stopped falling out, and started to grow back in. My conclusion is that there may be some type of chemical in the water that I am sensitive to, and while it didn’t bother me at first, over time chemical sensitivities can develope to the chemicals used to treat water supplies. I suggest using distilled water 3 or 4 times in a row to see if you notice a difference. I also use a few drops of Jojoba with whatever shampoo I use (4-5 drops and a nickel size of commercial shampoo– not that I recommend commercial shampoo), and it is pretty useful. I have been doing that for a few years now, because it helps reduce problems with oily hair, and I noticed it makes hair grow really thick. However, even with that, tap water at the new place did a number on me! Since chemicals also leech into water tables, I suspect trying washing with distilled water might be a useful strategy for anyone with this kind of hair-loss to give a try– even if on well water. 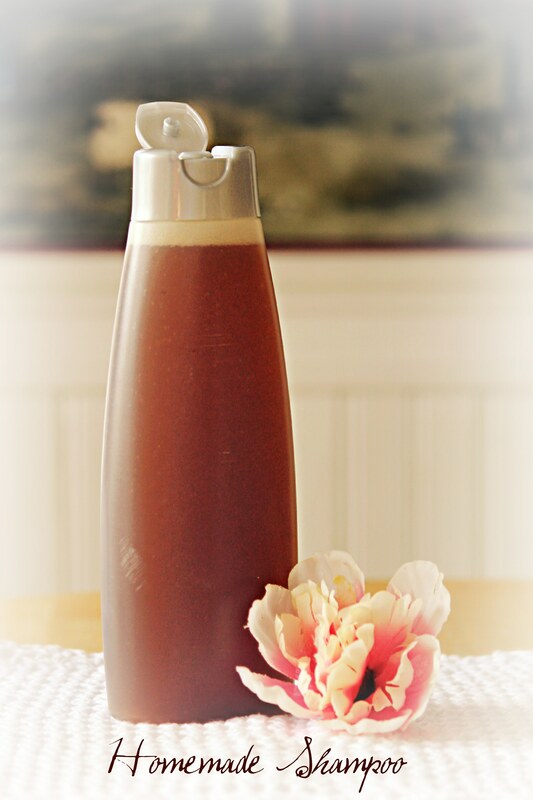 Re the shampoo recipie on this blog, it sounds great, I can’t wait to try it. Thanks, Ashley! Hi, my husband and I both suffer from autoimmune disorders. We are trying to eliminate commercial chemicals that are put on our bodies. I have already made my own bar soap and laundry soap. My friend makes her own 100% olive oil bar soap where I use a mix of oils for bar soap. I just found out that what my friend makes IS considered homemade Castile soap. So I’m planning on making some, then making my own liquid Castile soap and then making my own shampoo with it. 🙂 Does that sound right? I just tried last night my bar soap to shampoo my hair and then for conditioner, I mixed 1 cup water with 2 T apple cider vinegar and used an old shampoo bottle to squirt it on my hair then combed it. To my amazement, my naturally curly hair, combed free. I rinsed it out just a little and then went on my way. still today I like how clean and light my hair feels. Thank you for all your great recipes. We are also starting some internal cleanses by RenewLife. They are herbal combinations in capsule form. So far I am using the Cleanse Smart box and am finally sleeping better. Shred the bar soap with the food processor and then use the chopping blade to make the soap as fine as possible. They turn into tiny balls. 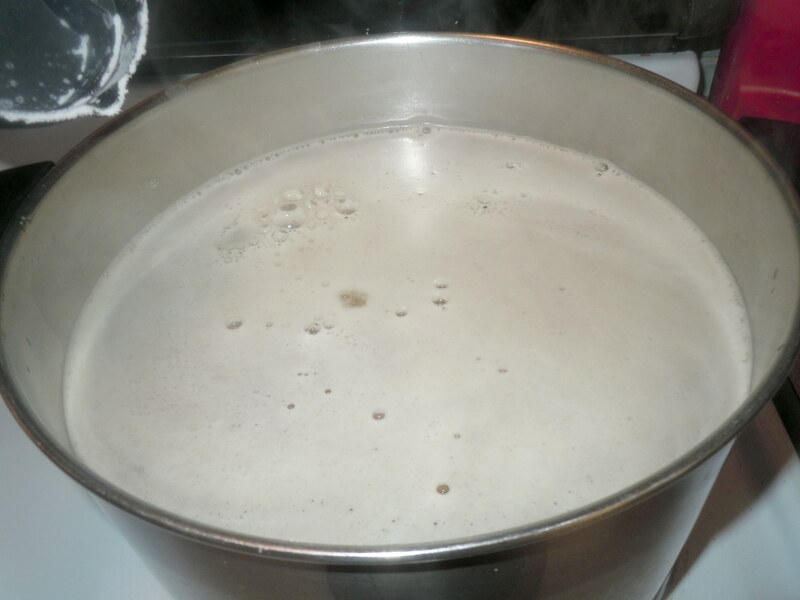 Then bring 3 quarts of water to a boil, dump in the baking soda. In 1 quart of water, put the 2 T xanthan gum and use the hand mixer to make it smooth. Dump that in the water and puree it with the hand mixer. Then dump in the shampoo bar pieces and puree until smooth. Pour into 2-quart jars and let it rest for 24 hours. Then I put them in saved empty shampoo bottles and added tea tree and lemon essential oils. It still doesn’t suds up, but it is more like a conditioner texture. I have to use about 4 T to cover all my hair and then I brush it through. After I rinse it out, I use a generous amount of vinegar and water 1:2 ratio to rinse my hair and brush it through before rinsing it. It really makes my hair soft. I have found that I have to still use a little bit of spray gel on the sides of my hair where it is frizzy. I want to try the anti frizz recipe listed here. I am certainly happy with the results. ****That’s it – I give it a little gentle shake before I use it, don’t know if that’s really necessary…. I use it after I wash/condition my hair while it’s still wet and on days I don’t wash my hair I spray it on my dry hair liberally….. Thank you for the comment and sharing your recipe with us 🙂 That sounds amazing! I don’t have jojoba oil but I could probably use something else instead. I definitely want to try this. Sometimes I will just put a small amount of coconut oil in my hair when getting out of the shower and it works great too. You just have to be careful not to put too much or it will look greasy. I was wanting to try your recipe for shampoo. Do you think it would be ok on color treated hair? Yes Tammy my hair has been colored and it is fine 🙂 The great thing about this is you can adjust the strength if you need to, enjoy! I found a really good homemade conditioner. Equal parts honey and olive or grapeseed oil. I use a shot glass. One shot honey and one shot in total of olive and grape seed oil togeher. Heat then shake it up. (about 15 secs in the microwave) This should be applied before you shampoo. I’ve been using this combo for about 3 weeks now and my hair loves it. PS I have fine curly and highlighted hair..
the favor”.I am attempting to find things to improve my web site! Sure I do not mind as long as you link back to me 😀 The whole reason I started this blog was to help others so by all means please share! Hi Brandy, Thanks for the tip. I love using coconut oil in my hair too. I will take a very small amount and run it through the ends of my hair after taking a shower. Not too much or it will look greasy but just enough to stop the frizz 🙂 Have you tried it for your skin too? We use it for everything around here lol. Thanks for stopping by! Add a spoonful of honey! Hi Cyprus. Have you tried it with honey? It has crossed my mind before and I have been meaning to try it. I am surprised it doesn’t feel sticky, thanks! How would you use a bar of soap instead of liquid soap in this recipe? What are your thoughts on substituting some of the water for the tea brewing with aloe vera gel? Thanks for the post! I have been struggling finding a good homemade shampoo recipe that lathers enough for my family members liking and also leaves your hair feeling clean. I have been sing soap flakes, but have not tried one with a liquid castile soap base yet, so I think I will try this recipe next. My question is about using tea in body products. I make an herbal vinegar hair rinse with apple cider vinegar and an herbal infusion/tea. I tried making a big batch of the herbal infusion to save and turn into the hair rinse later, but didn’t realize it needed to be refrigerated and it ended up getting moldy. I was afraid the other hair rinses I had sold on my website would have gone bad, but I realized if i mix the infusion with the vinegar right away the vinegar preserves it. But how are herbal infusions used in shampoos and lotions without it going bad? Do soaps or waxes preserve it? I’m now afraid to use infusions in my products without vinegar. Thanks! 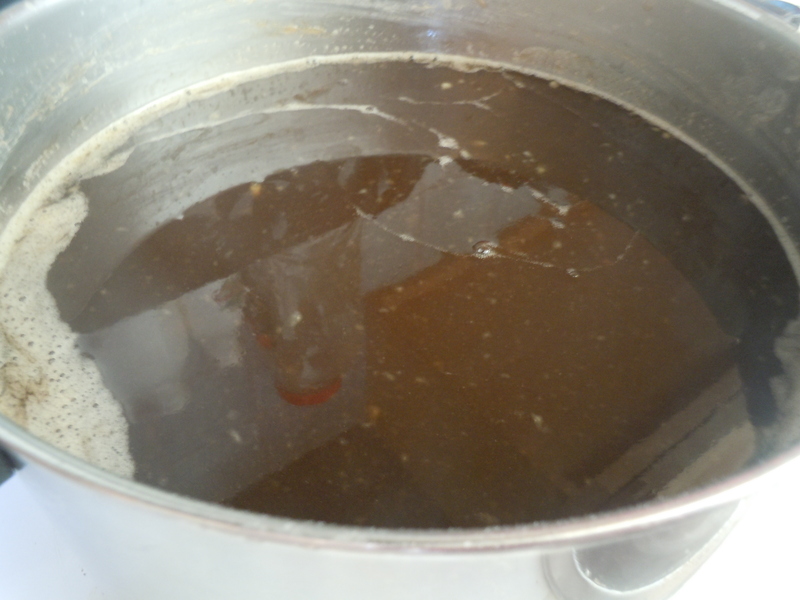 I am just curious about something….I make the homemade laundry soap ALL the time and I LOVE it. I will NEVER buy commercial again. However, as others had mentioned, I too noticed that the soap sometimes came out watery. On a whim one day I decided to add my own thickening agent. I took 1 tablespoon of cornstarch (which is very cheap and lasts forever) and added it to 1 tablespoon of water until it dissolved. I then added that to the 3 gallons of laundry soap and it turned out PERFECT. My soap was exactly like the commercial laundry soaps…..actually it was better ;). So now I’m wondering if the same could be done here, obviously in a much smaller ratio. Its so MUCHHH cheaper (and easier to find) than the xanthan gum. I’ve seen plenty of homemade recipes for dry shampoo that contain cornstarch so it has to be safe right? Thanks!! Hi, I just made your shampoo last night and it turned out really well but I feel like I was having to use quite a lot to get my whole head. Is that normal? has anyone gotten it in their eyes? cus i think i did and it was like the end of the world for a second. on the plus side as soon as your eyes get a bit of tears in them it stops…but you gotta rinse or it will happen again. at least thats what happened to me. but i just used it for the first time and i really like it. my hair is similar to yours ashley, so it seems to have worked very well. i feel accomplished, like any american would if they did simple things for themselves instead of paying someone else to stock pile things that are bad for us 🙂 thanks ashley! Ouch that doesn’t sound fun! I have somehow avoided getting it into my eyes (even though I am so clumsy lol). Glad you like it! Hair has a pH of 4 to 5.5, so to not disrupt your acid mantle (sebum production on your scalp) you should only use pH balanced shampoos. I have done a lot of research on this, I have also attended beauty school so I can say this is true. Using highly alkaline solutions on your hair (baking soda, bronners soaps, etc.) though it feels soft and manageable that is really the disulfide bonds in your internal hair structure being weakened by the alkaline solution.The colors and perms that are performed use this method to work, they “open up” your hair to deposit the color or permanent, then a clarifying shampoo is used to “close” your hair and lock the color or permanent in. To then bring your hair down to it’s proper pH a acidic solution (apple cider vinegar) when using a alkalinic cleanser is used, this is called clarifying. This is not healthy for your hair or your scalp. There is a great tutorial on youtube on your hair’s pH and why this rollercoaster up and down the pH scale is highly disruptive. The maker of these tutorials is a licensed salon owner and stylist. You can check her out at KimmayTube on youtube. Or, you can ask any stylist that you know. This is why so many shampoos on the market advertise that it is pH balanced. Because that is very important. So forcing your hair to go up to an 8 or 9 and then forcing it back down to a 4.5 in a short period of time is very damaging. If you would like to keep your hair in it’s proper pH, and love making homemade beauty products, then mix 1/4 cup of coconut milk (store bought or homemade both are fine) and 3 heaping tablespoons of aloe vera gel (lily of the desert), shake well, strain through cheesecloth to remove aloe fibers, and wallah! You have pH balanced shampoo that cleanses your hair, stimulates growth of your hair, and is edible! Food for your hair! Refrigerate after use, it generally has a 1 week shelf life. You can find this recipe on youtube as well. I find that if you pour it on your scalp only, and massage and let rest till you are done with your shower, then rinse, it is magic on your hair. Just google all the benefits of aloe vera, and you will see. Then google all the benefits of coconut milk, and you will see again. This shampoo has been so amazing, I can’t ever imagine using anything else ever again. Hey so I made this and I had the same problem where it seemed like my hair was extra oily. and then I used the shampoo after I conditioned and it worked great! I love this shampoo! First off thanks for sharing your recipe. I just made my very first batch. I modified slightly, using chamomile tea as my basis and a mixture of essential oils (peanut, almond, vitamin E, olive, and lanolin) it is a product by Home Health called Almond Glow: Almond Skin Lotion. I used this because I had it at home and I am tryig be frugal, plus it smells like the almond castille soap used in the recipe:) I also added in some lemon juice (half of a lemon juiced) in efforts of making the mixture more acidic and maybe naturally lightening my hair. I used baking soda and xantham gum just as your recipe called for. 1. My Wal-Mart did not carry xantham gum, so maybe others will have this problem. I found mine in Harris Teeter. 2. When I added my baking soda, it did not fizz up or look similar to your picture. I got worried, but continued forward. The end product feels thick, has no chuncks, and smells great so I don’t think I messed anything up. I going to use my new homemade shampoo for about a week and report back to you. Thank you so much for sharing this recipe, I’m thrilled to try it! Hellow, I live in Mexico and I was wondering if this can really work for dogs. I have a Newfoundland and I am paying alot of money for shampoo, so I want to try this but I am not sure if it will be good for my bunddle of joy. He has very thick and long black hair. If you know of any recipie that can be safe for dogs PLEASE let me know. This might actually be a really good shampoo for your dog, it is all natural! I would use plain, unscented castile soap. If you wanted to use essential oils I would definitely find out if they are safe for dogs first. It rinses easily which I know would be a big plus with a Newfoundland. If any shampoo gets left in the fur it could cause irritation. I used to bathe dogs at a grooming shop and had a few Newfoundlands that were regulars, that is a lot of work!! Anyways I do not see why this would be a problem to use on him, but I am not sure how good it would be on really dirty spots like where they drool a lot (I know it can get caked on there LOL). In the grooming shop we used plain Dawn dish detergent on those spots but not the entire body. If you try it please let me know how it works out for you! I made it, and it was really easy. But when i use it, it is very liquidy and does not lather up at all. Also i feel like there is a residue in my hair after i am done with my shower. Did i do something wrong? Hi Shell, it is rather liquidy and does not suds up very much (compared to regular shampoo it probably does not feel like any suds at all) I am not sure about the residue, I have never experienced that sorry. It could be the combo of this shampoo and the water in your house. I found out why this leaves residue in the hair. Before using this recipe, the best thing is to get rid of the build-up in your hair; first wash your hair with just plain baking soda and rinse with apple cider vinegar. After using the baking soda a few times, your hair will be free of build-up and good for this recipe. I always have a apple cider vinegar as conditioner after wash and just rinse after leaving in the hair for a few minutes and my hair has never been healthier. Hi Shell and Hadiaroya. It is supposed to be thin and not lather much. It is not supposed to be exactly like regular store bought shampoo. It can take a little while to get used to but suds do not equal clean. As far as the residue I am not sure, My hair always feels clean so I am not sure what to tell you, sorry. Maybe reading through some of the other comments might help?? I just made this shampoo. I used camomile and peppermint tea and lavender and peppermint EO. I couldn’t find Xantham gum in my area so I made it without it. I LOVE this shampoo. My hair is soft and shiny unlike when I tried a coconut milk DIY shampoo. Thank you for sharing this formula. Hi Margaret. So glad you like it! 🙂 Thank you. Okay, I thought I was going to have to give up on homemade shampoos… I’ve tried so many, and they were always a disaster for my hair. Since I have auburn (straight/fine) hair, I used rose rips instead of plain tea for a little color boost, and I doubled the xanthan gum and essential oil measurements (I used sweet orange EO). Wow! After a week of every-other-day use, I’m calling this a success. I’ve always hated shampoo day-too-clean-static-y hair. I’m in awe that the recipe uses such a teensy amount of soap, yet it cleans great, and my hair even feels a bit softer than usual – neither greasy nor dried out. Thanks SO much for the recipe! Hi Kim, so glad you like it 🙂 Thanks for taking the time to let us know! Would it be harmful to put in a little glycerin to add some lather for the sud seekers? I have been using this for about a week now, and I like the texture but the only issues I have is the feeling after I rinse the shampoo, before applying conditioner, it feels very dry and strange. Also, I am finding most of my hair very nice, shiny, clean, but some oily spots underneath so I’m going to keep trying with more, and scrubbing longer. Overall great recipe, I’m glad to get away from store bought shampoo!! And watch out with the Simply-U brand, its sulfate and paraben free but its still has artificial ingredients, including the fragrance which I’m sure has pthalates!! I’m on my way to finding a conditioner recipe as well, I’m waiting on a shipment of almond, jojoba, and avocado oils to arrive! Yes you do have to do a little massaging, more than normal shampoo. I hope you find a conditioner recipe you like, I still have not found one. I’m making my second batch of this shampoo after using the first batch for the past 2 months. I love it and have given samples to several of my coworkers who also think it’s fantastic since a batch is so big. My hair is curly (permed) and gets oily very quickly. I also have a sensitive scalp and have been trying to find something for years that wouldn’t irritate my skin and keep my hair clean. My scalp never felt better and I no longer have dandruff. I’ve noticed that with this shampoo, I normally don’t need conditioner because it feels so sleek in the shower and my curls are so springy which i wouldn’t want to weigh down with a heavy conditioner. I would recommend this shampoo to anyone with permed curly hair to extend the life of their curls. As for apple cider vinegar for a conditioner which I have also tried, it works and the smell goes away when it dries but I notice that the smell returns when i work out or sweat so it’s not for me. Thank for posting this wonderful recipe and tips! Hi Rebecca. Thank you for taking the time to come back and write a review. I am so glad you like it 🙂 Thank you for sharing it with others too! This looks like a great recipe. And I’ve found a great all natural conditioner- oatmeal!! I just buy colloidal oatmeal and mix with water. Pour it on hair and let it sit a couple of minutes and rinse. It’s perfect! Did you make this with black tea instead of water because you have darker hair or for some other reason? I have light hair (well, at least until I am brave enough to let it grow out) and was wondering if the tea would darken my hair. Thanks. I originally made it with Jasmine Green Tea for the scent, it was lovely 🙂 I didn’t notice any change in my hair color. Hope that helps! this piece of writing is really a nice post, keep it up. i want to try a natural tea infuzed shampoo for my grooming shop. however, i do not want to refridgerate it. will this recipe not go bad or mold? Hi Connie. It will eventually go bad but since grooming shops go through shampoo so fast you probably would not have to worry about it. Adding some tea tree essential oil once it is cooled down would help prevent mold. Now I am not sure how well this would work for getting dogs clean. I used to work in a grooming shop so I know how nasty some can get lol. Whew! Lots of comments. I’ll be trying your recipe although I may tweak it some. I’ll come back and let you know how it goes…….Thanks for sharing! I made your shampoo, but use a dab of regular conditioner that I literally run through my hair and rinse after I wash. It has been working great for the last 2 weeks, but now I am seeing and feeling this greasy residue. Am I not using enough shampoo or do you think it’s my conditioner that is messing things up for me? Also do you use any product (mousse, gel) for styling? Thanks. Hi Tiffany. I am not sure what the problem is… some others have reported a greasy feeling but I have never had that problem. Maybe the conditioner building up, the water in your house, any styling product you may use? Your hair may just be adjusting also. This one recipe is not for everyone, there are so many different skin and hair types. Maybe a minor adjustment to the ingredients would make it work better for you? If you think your hair is just adjusting try brushing a little cornstarch or arrowroot powder through your hair when it is dry to soak up the extra oil. Sorry I can’t be of more help but everyone is different so I just don’t know what is causing it. There are a few things it could be. First, this is a sulfate free recipe–this shampoo does not strip the hair the way traditional shampoos do, so what you may be experiencing is ‘funky hair syndrome’ while your hair re-adjusts. It is a good idea to cut back on conditioner or eliminate it entirely when switching to homemade shampoos because the silicons will not be stripped out of your hair with homemade varieties. The build up of silicon could contribute to this, so I’d switch to a silicon-free conditioner and see if that helps as well. I’ve also heard reports around the internet that chlorine plays a much bigger role in your hair than it does with store-bought products, so getting a chlorine filter for your shower head may help your hair out in this department (they’re like $20 at Lowes or Home Depot). Truly, making a switch like this does have a big effect on your hair, so patience and experimentation is key. I’d read some blogs on no-shampoo methods and homemade shampoos to help you get a feel for what to do. Thank you so much for your responses. I actually stopped the day I posted the conditioner I was using. I would say I have seen a little improvement already. I will see if I can live without the conditioner, if not I will try the silicon free one suggested. Thank you so much. Truly love this blog! I’m slightly sure I will be told a lot of new stuff proper here! Good luck for the next! Hi Ashley, been using your lovely shampoo recipe for a couple of weeks now and I love it!!! I don’t use the tea just the water and it makes my hair so soft. I did the straight baking soda in water for a couple of months and it was terrible, oily up top and dry and straw like for the rest of my hair. I so wanted it to work and was gutted that I had to go back to my regular shampoo. I came across your recipe from a pinterest thingy that had your blog attached to it and I just love it. Great texture, bit of lather so its feels a bit closer to what we are all used to and it does such a great job of cleaning my hair but not drying it out. Thank you so much for your experimentation and for posting your recipe. Absolutely love it and will be sharing it on my blog. Love this, but I make only a pint at a time because I find that it sours. BTW my hair is fairly thick but fine. Normal (neither oily nor dry) and beginning to gray. I use mostly chamomile but sometimes combine with green and/or black tea. I actually find that I don’t have to color as often when I use this shampoo! Great recipe, Thanx……. As a helpful note on thickening. If you use 2 tbs of Xanthan Gum and add glycerin to it until it has the consistency of honey (thick but able 2 pour) then gradually add it to the other liquid. You will have a more traditional shampoo thickness. ( In addition, maybe decrease the tea/h20 amount). For those with trouble with hard water, maybe use distilled water. For those with fine hair, I add 1/4 cup of organic coconut milk…either homemade or the ones in the cartons work best. It works great on my daughter’s hair. She has very fine hair. You can use lavender, rosemary, peppermint or orange or a combo for this type of hair. I’ve been using lavender for her hair. Just a note when adding the baking soda, it may bubble over. Pour it a little at a time. I also used the thicker formula. Thanks Ashley for posting all your findings. They have been so helpful. Have you found a regular daily conditioner recipe yet? I’ve been using this shampoo for two weeks now and I’m sorry to say that it’s not working for me. My hair feels dirty and full of some strange residue. It does look OK but the feel is terrible. And some white residue transfers to my hairbrush also. looking for conditioner? Best one to use – organic coconut oil – a little (pea size?) in your palm, rub your hands together to spread and melt – apply to hair. This is a leave in conditioner. Works great – the amount you need will depend on your hair. what is the purpose of the tea? does changing the type of tea, do different things for the hair? is the xanthum gum just for thickening purposes? can I use cornstarch instead? The xanthan gum is for thickening yes. I have not tried just cornstarch so I am not sure how it would come out… but I don’t think it would be a problem. Good luck. If xanthan gum is for thickening then would arrowroot work as well? I just used this shampoo. I love it! It has left my hair shiny and it seems not as weighed down as commercial shampoo. I used the recipe with some adjustments. I used about 4 or 5 cups less water. and about a 1/4 cup more arrowroot. I shook it up before use and shampooed twice but it worked well. My hair also seems to be smoother. Hey, thanks for the recipe, I will be sure to try it! Also for conditioner I wonder if you have ever tried using pure coconut oil. I have been doing this for a while now and I love it! My hair is soft, shiny and is growing super healthy! I just put a very small amount (about pea sized amount for my pixie cut length hair) into my palms whilst in the shower, rub them together to melt the oil and then rub through my hair. I then duck my hair back under warm water to rinse off any excess oil and towel/ air dry when I get out! That simple for beautiful hair. Please beware though that if you use too much oil it will look oily, a little truly does go a long way! First, what’s up with all the SUV comments? So confusing. Back to the poo! This recipe is awesome. My hair looks amazing. Yay! Using sterile equipment and BOILING your water properly for 10 minutes, unless you used distilled water is a must. Unfortunately I discovered this too late in the process but hope that a couple of minutes light boiling will help. We have catchment water that is not drinkable so my guess is the shelf life is going to be short on this batch. We also live in a very humid rainforest environment on Hawaii so it’s a constant fungus and mold battle going on over here. The EO will hopefully help too. I also make half a batch from what Ashley is suggesting and give a way travel sized bottles to my friends. Someone made an obnoxious comment, IMO, about how bad this recipe is for your hair and suggested an aloe vera and coconut milk (or oil?) concoction instead. Although it seems logical that the juggling back and forth in PH may shock the hair, I think adding honey to Ashley’s recipe will take care of that aspect. In any case, I’m at least not putting carcinogens in my system by using regular poo crap. Others have mentioned residue build up after a while. I think it was on Lisa Bronner’s blog I read about castile soap and vinegar. They cancel each other out so whatever residue you have in your hair (if the residue is from the soap) will disappear if you use an apple cider vinegar rinse afterwards. THEN.. someone mentioner how the ACV smell re-appears when working out. I do Bikram Yoga several times a week and haven’t really noticed anything. Perhaps because I dilute a tbsp ACV in 2 cups of water? Or has my nose just gotten so used to it I don’t smell it? I have no idea. Wonder what kind of tea would help with gray hair? Does this shampoo leave your hair with a residue? I’ve tried lots of different recipies and they all leave me either feeling greasy or sticky. I was wondering what the xanthan gum was for, is it to help thicken the formula or does it actually have a specific purpose? I have been making my own shampoo with castile soap, but had to stop recently; my hair wasn’t liking it anymore. I’m hoping to try this soon, maybe it will be better. This looks great but what kind of tea did you use? Thanks! I added the xanthan gum before the castile soap and still ended up with clumps. Any recommendations? I would try a blender, in small batches or an immersion blender if you have one. Good luck! Hi, i’m wondering about bacteria & other nasties beginning in your water base shampoo? should we not also add potassium sorbate or other, as close to natural, preservative? The essential oils act as a natural preservative for a time. I believe mine did go bad after about 3 months sitting in a cabinet. You can always make smaller amounts if you are worried about this, or store extra in the fridge maybe. Sorry I am just now getting around to answering some comments. I’m a complete newby to “natural” skin/hair/etc care products. But I jumped right in and quickly found as many have mentioned, other recipes left my short, fine, highlighted hair feeling very gummy. I read all of the why’s and altered the recipes…but even within a few days of trial thought there is no way I can deal with this hair. Then I found YOUR recipe and it was completely different. I tried it and LOVE it! I didn’t heat anything. I used distilled water (w/o tea), added the baking soda, and then whisked the xanthan gum in a tiny bit at a time with no problem or clumping. I did use a very diluted (1 T acv/8 oz distilled water + orange eo rinse with a spray bottle)…by the way, this smelled great…nothing like my first attempt with white vinegar. I have washed my hair every day for as long as I can remember (I’m in my 50’s). I am anxious to get through the complete hair adjusting so that I can shampoo less frequently. I also would add that it is not flat at all (as it was with commercial products). It stands at the roots way better than it ever did. Thank you for sharing this recipe!!! Mrs RG I am very happy to hear this. I hope you are still having success with it 😀 Sorry for the late reply I was actually recovering from surgery at the time you posted this and life has been crazy since. If I made it with tea, when (if ever) will it ever spoil? Mine went bad about about 3 months in the bathroom cabinet. That was with essential oils. If you are worried about this, I recommend making a half batch or storing the extra in the fridge. Sorry for the late reply! How did you know it was bad…smell? mold? Thanks! I’m really excited about trying this. If you’re still looking for a diy conditioner, I use an unrefined coconut oil for mine. Simply that. Sometimes I add essential oils (Mostly pennyroyal to keep ticks and mosquitoes away, while I’m out in the woods. It also works as a lotion for the same.). You just brush it in and leave it overnight. In the morning, you wash. Of course, that’s just a time thing. When I’m just at the house cleaning, I’ll put it in in the morning. It’s about a once a week thing. When I have made it, it has always been thin. Was it cold in the room? I believe the soap is coconut oil based and coconut oil by itself will harden in chilly temps so that may have made your soap thicken up. Hello! Just a quick question, it might sound silly:) so this gallon of tea is actually 3,8 litres? I am not good at gallons so I’ve looked on internet to transform into litres and shows this amount.Thank you so much! Would you need to use xanthan gum or can it be skipped? I just made this it’s amazing! I did hibiscus and chamomile tea with tea tree Castile and sweet orange essential oil. I had to alter the recipe a bit. So I did a little grass fed gelatin which is good for hair too. I’m in love with it thanks so much! Tried a tweaked version of this recipe tonight and it’s the first recipe that hasn’t made my hair look like a grease factory! I brewed a mixture of chamomile flowers, moringa green tea, lavender and orange peel, and that made just over a litre. I added 1/4 cup baking soda, 1/2 cup castile, some lemongrass and sandalwood oils and then added a little salt water to try to thicken it a little. I poured it into a bottle and then I poured some into a jar and onto my hair in the shower while massaging it into my scalp. I gave it a good rinse, then a good spritz with acv and distilled water. After 2 or 3 mins, rinsed with lukewarm water and then a final cold rinse with distilled water. It actually feels clean!!! !